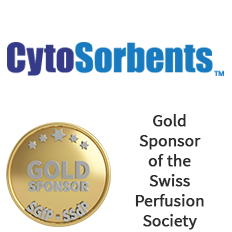 Due to his heterogeneous constellation, the Swiss Society of Perfusion is a worldwide unique build. Four languages, different mentalities, different professional point of views and different regional needs are creating a complex landscape of perfusion techniques. The aim of our Society is, despite this world of differences, to achieve a way in which all members can identify a common cause to reach common goals respecting different mentalities, regional, linguistical and professional features. Members can login to the members section, please login in the "Member Login" in the lower left of the page!